Add sumac and water to a bowl and let sit for approx. 10 min. In the meantime, slice mini cucumbers and radishes. Peel and finely slice red onion, halve cherry tomatoes, and roughly chop parsley and mint. Peel and finely chop garlic. Add olive oil, garlic, lemon juice, dried mint, and soaked sumac to a bowl and stir to combine. Season with salt and pepper to taste. Heat vegetable oil in a frying pan and fry pita breads on both sides until golden brown. Add the sliced vegetables, herbs, and dressing to a large bowl and toss to coat. Tear crispy pita breads into smaller chunks and add to the bowl. 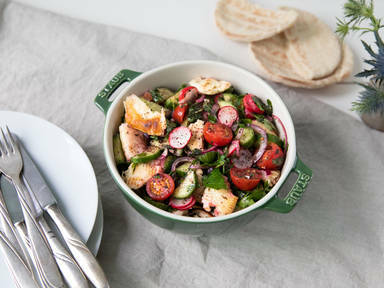 Give it a quick mix and serve fattoush with more sumac on top. Enjoy!